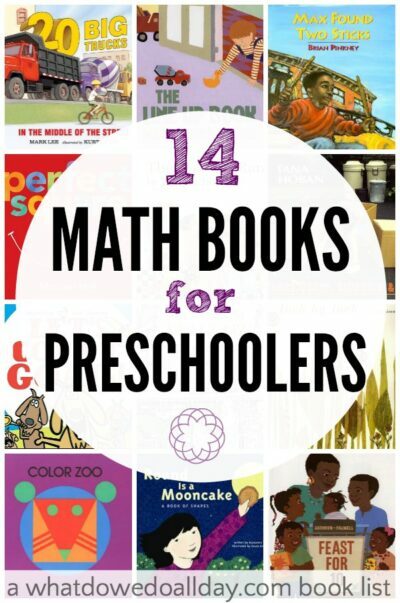 This list of math books for preschoolers is the second in a series of math book lists I am doing in collaboration with The Measured Mom. Last time I shared math books for babies and toddlers, and although these preschool books are along similar themes of counting, exploring shapes and patterns, the concepts are ever so slightly more sophisticated in a way that challenge 3 to 5 year olds, who are rapidly expanding on their ability to understand mathematical concepts. As you know I LOVE effortless teaching such as these easy preschool math activities for preschoolers, and reading to your kids is certainly one of the easiest ways to help your child! Preschoolers are ready to practice counting objects, forwards and backwards. They can start to apply counting to everyday life. These books also encourage them so see math in the world around them. Twenty Big Trucks in the Middle of the Street will be loved by kids everywhere. I mean, what kid doesn’t love a good traffic jam? When an ice cream truck breaks down, the pile up begins. A young boy on a bicycle offers various solutions to solve the problem and when the jam clears, he gets his sweet reward. Feast for 10. A family shops for, prepares and sits down together for a meal. I particularly love books that show math in everyday situations such as shopping and cooking. It might even get your little one interested in counting next time you put her in the shopping cart at the grocery store! Plus, I’m all for books that show families having fun together. Let’s Count Goats! is a charming, rhyming book by Mem Fox about counting goats doing silly things. I’ve read it many times during story time with the preschool crowd and it never fails to get the kids laughing. Have You Seen My Dragon?> A boy searches all over an intricately drawn New York City for his dragon. Kids will have great fun searching for hidden objects while they practice counting to 20. This was one of my kids’ favorite books of last year. Kids ages 3-5 are learning skills that they will apply to advanced mathematics later on in life. Don’t push them, though! Let them learn through informal play with patterns and shapes. These books will feed into that natural curiosity and they will also enjoy exploring shapes by making their own shape book like this one! Max Found Two Sticks. Guess where the most engaging patterns are located? Music! I love this book about a boy who starts to beat out musical patterns with two sticks he finds during a breezy day. He taps out the sounds he hears around him in rhythmic patterns. Read it aloud to kids and encourage them to tap out or say their own musical patterns. Round is a Mooncake: A Book of Shapes. Told in a gentle rhyme, a young girl looks around her home and neighborhood and discovers the shapes in objects. Many of the objects are culturally Chinese, like dim sum and inking stones. There is a glossary at the back so kids can learn about any unfamiliar items. I’m a big fan of Grace Lin’s illustrations, which bring this book to life. Color Zoo Board Book. Lois Ehlert’s signature bold, graphic style is on display with this clever die-cut shape book. As each page is turned a new layer reveals a different animal. On the reverse of each page, the shape is labelled so young kids can compare which shapes are used to make each creature. Inch by Inch. This classic book does more than show how an inchworm outwits hungry birds, it introduces kids to the concept of measurement in a fun way. The Line Up Book>. Do you kids love to line things up? My boys were forever creating criss-crossing lines of cars and trucks. Next time you step over one of their long, winding lines of toys pat yourself on the back, because your child is learning all about patterning and spatial relationships, important skills for math learning. Rooster’s Off to See the World. As they follow rooster in his journey, kids first count groups of animals as they gather to join rooster. Then as each of the groups get tired, they count backwards, setting the stage for future addition and subtraction learning. Changes, Changes>. In this winsome story, two toys build a block house. When things start to go awry, they cleverly rebuild to keep up with the changing situation. Unit Blocks are probably the best toy for promoting early math learning in preschool aged kids (and beyond). The Doorbell Rang. Be sure to have a plate of cookies nearby when you read this book! Hutchins uses a group of diverse children sitting down for a snack as the setting for a story about sharing and a very simple and early lesson in division. The doorbell starts ringing and as more children start arriving the plate of cookies is divided among more and more kids. Cubes, Cones, Cylinders, & Spheres. Tana Hoban has a collection of books that are all worth checking out of the library. Sit down with your child and identify the 3 dimensional objects in Hoban’s photographs. We are used to pointing our squares, triangles and circles, but their 3-D counterparts should not be left out of the equation. Perfect Square is a popular book in which a brightly colored square transforms when it is cut and rearranged. You will be unable to resist pairing this book with an art project as your preschooler explores his own power to transform shapes with a little cutting and tearing. What books would you add to this list? There are many! All of these math books for preschoolers are jumping off points for applying math in everyday life. 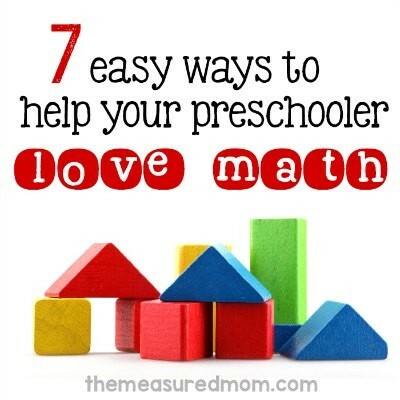 For more on easy and fun hands-on activities to encourage your young children to love math, read 7 Simple Math Activities for Preschool at The Measured Mom. My kids always loved The Doorbell Rang and still love to read it now (they’re almost 9!). It’s such a family fave. It’s such a fun book. Really fun list! We are big fans of color zoo, funny it didn’t occur to me it teaches math! It depends. For toddlers I like it short! But preschoolers, I don’t mind a bit longer text as long as it pushes the story forward. One Potato Two Potato by Cynthia DeFelice is a great math book on doubling – an early dose of exponential math!